In 1952, behind The Railway Hotel in Hornsey, North London, a little factory began making very special cars. Lotus. The name exudes style and adventure; but back then it was only just beginning to make its name. Later on, as they grew, they moved to Cheshunt, and finally the sire of an old RAF base at Wymondham where it used stretches of the runway to test its cars. They had kudos. Style. But they lacked something. So, folklore has it, they decided to get noticed. Word was out that Cubby Broccoli was planning another Bond movie. 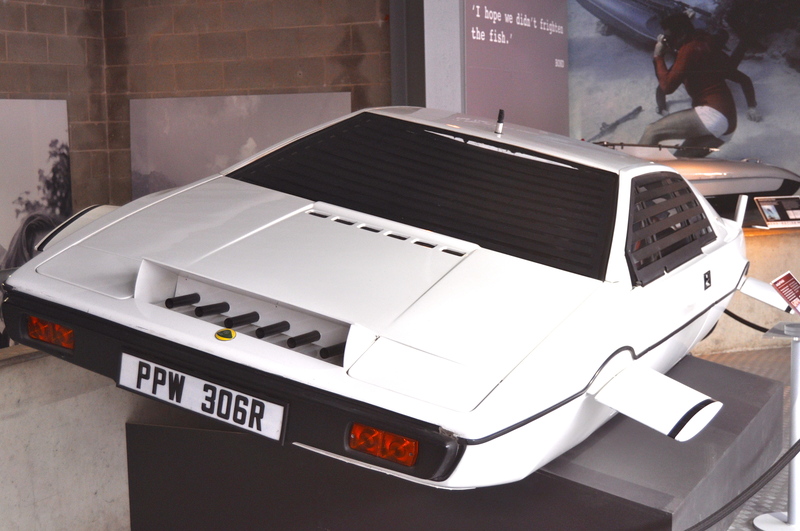 The Spy Who Loved me was a twinkle in its producer’s eye when the Lotus PR team decided to park a gleaming white Lotus Esprit outside Broccoli’s office at Pinewood Studios near London. One glance at those lines, and the rest was movie history. For though James Bond has road tested many sets of wheels, there can be few people who have not seen the Lotus Esprit which begins its life above water, but creates the ultimate sharp intake of breath when it transforms effortlessly into a submersible. The real-life cockpit wasn’t dry like that. Frogmen with breathing gear had to drive it; but it was submersible, just the same. They made seven shells but only one roadworthy car for the film. And after its moment of glory it was stashed away in storage, on a 10-year lease at a storage company in Long Island. And when that ran out, it appears everyone had forgotten about it. The company sold off a job lot of storage, and a local couple was astounded to find themselves the owner of the Bond Lotus. It has enjoyed a reprise, however, whilst on loan to the Beaulieu National Motor Museum, where it has been on show as part of their Bond in Motion:50 vehicles, 50 years exhibition. And in September, it will begin a new chapter of its life. RM Auctions are about to offer the iconic car at auction. There is still time, however, to catch a glimpse of it before it changes hands. I stood next to this astounding piece of movie history, and snapped and snapped for all I was worth. For a factory which made special cars, it was a very special car indeed. Posted in Places to visitTagged 1977, James Bond, Lotus Esprit, submersible, The Spy Who Loved MeBookmark the permalink. I’ve always loved the idea of amphibious cars. I’m disappointed to hear that frogmen had to drive it underwater…another dream shattered. That’s no way to start a Monday morning, Kate….shattering the dreams of loyal followers. I shall have to drown my sorrows ,,,in the pool: Christ, it’s hot this morning. It is here, I can’t imagine how it must be there! Hope the day by the pool was a good one, Roger. Apparently there were several versions of the car. One for the underwater scenes, one for the emergence, another for road scenes. Trouble was the underwater version was rather leaky!! Loved that scene in the movie, thought it was just the coolest thing ever. Roger’s best outing as Bond in me ‘umble…. I agree. Though I was never really a Moore-as-Bond fan. Sean Connery, yes; Timothy Dalton, definitely; Daniel Craig, irresistably. But Moore: always a little on the smooth side for me. Lazenby weren’t bad but I think Craig is the boy! The Top Gear episode where they tried to remake this car and Hammond drove it underwater is hilarious. Well worth a watch! On a more serious note, visiting the Lotus factory outside Norwich is an excellent day out… and if you pay a little extra you get to drive one at high speed on their airfield/test track. That sounds like a capital outing to me, LU! Thanks for the tip-off! Ha! It is a beautiful thing, Andra. Great Bond clip . . . thanks for the extra insights, Kate. Pleasure, Nancy. We’ll wait for the auction and see what happens. It’s a good colour, Tom. I was expecting something risque because my first read of title misread as Underwear Spymobile. Well nice concept of mine anyway. Sets off a whole new train of thought, Carl! I loved that scene. Especially the reactions from everyone on the beach when the car emerged, obligatory staring at a bottle’s label and all! It was movie magic, Heather! Fascinating bit of marketing history. It would be difficult to miss a car like that parked outside one’s office. I would 🙂 I’d be drooling. What an auction that will be. I’m looking forward to watching the results on the news, Penny. I know very little about cars and almost don’t take notice, but I sure do of this one! I can hardly imagine the surprise and glee when the couple who bought the storage lot discovered what was inside. I find it hard to believe it was forgotten. Such a treat to be up close and personal, Kate. An amazingly successful bit of advertising! I’m sure they would have got the leak issues sorted out if it were designed for more than one iconic film scene. You are most charitable, Col. You may be right. This is so cool, Kate. I’ve loved Bond films, its automobiles and gadgets since I first saw “Goldfinger.” The bidding war should be huge. It undoubtably will be, Judy!